South African police have fired rubber bullets and tear gas to disperse protesters near a mine owned by Anglo American Platinum, a day after a deal ended a strike in Marikana. “We are not tolerating any illegal gatherings,” a police spokesman said. 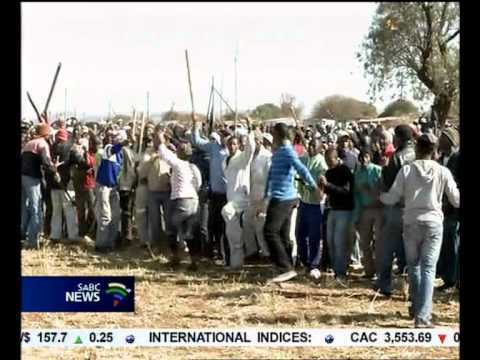 Workers at the Lonmin-owned Marikana platinum mine ended their six-week strike after accepting a 22% pay rise. The strikes have spread to other mines in South Africa, one of the world’s biggest producers of precious metals. On Monday, South Africa’s President Jacob Zuma said that the disruption had cost the industry $548 million in lost output. The unrest came as Anglo American Platinum (Amplats), the world’s largest platinum producer, re-opened its mines after they were closed last week following huge protests. Amplats spokeswoman Mpumi Sithole said the mines in Rustenburg, the centre of South Africa’s platinum mining – about 80 km (50 miles) north-east of Johannesburg – were operational. She said the police had “dispersed a group of people gathering illegally at Sondela informal settlement [near the mine]” and said it was not clear if they were Amplats workers. “Police utilized tear gas and stun grenades, and rubber bullets were used at the squatter camp,” said police spokesman Captain Dennis Adriao. “As we have said, we are not tolerating any illegal gatherings,” he said. After weeks of unrest, the government last week announced that it would clamp down on the protests. In the nearby Marikana mine, where police last month shot dead 34 protesters, workers were celebrating the end of the strike, reports the AP news agency. Riddick Mofokeng, another miner, said he felt good about the deal. “It is not what we expected to get, but it is great,” he said. The miners had been demanding a monthly salary of 12,500 rand ($1,513) – they currently earn between 4,000 and 5,000 rand. As well as a pay rise of 11-22%, they will get a one-off payment of 2,000 rand to help cover the weeks of not being paid while they were on strike. Analysts had warned that the Lonmin deal could encourage other mines to down tools to obtain pay hikes. Some 15,000 miners at Gold Fields remain on strike. Last month, police opened fire on demonstrators at the mine in Marikana, killing 34 striking workers. Ten people, including two police officers, had already died in the protests. President Jacob Zuma has ordered a judicial inquiry into what has become known as the “Marikana massacre” – the deadliest police action since the end of apartheid in 1994.